We’d love your help. Let us know what’s wrong with this preview of Grime and Punishment by Jill Churchill. It's So hard to Kill Good Help These Days. . .With three kids to raise on her own, Jane Jeffry sometimes needs a hand with the housework. But many of her complaining neighbors believe that the Happy Helper cleaning lady they all share wouldn't know a dustball if she was choking on it. That hardly seems reason enough, however, to do the disreputable domestic in. So when the It's So hard to Kill Good Help These Days. . .With three kids to raise on her own, Jane Jeffry sometimes needs a hand with the housework. But many of her complaining neighbors believe that the Happy Helper cleaning lady they all share wouldn't know a dustball if she was choking on it. That hardly seems reason enough, however, to do the disreputable domestic in. To ask other readers questions about Grime and Punishment, please sign up. Not finishing books, no matter how terrible or clashing, is not my way. However with thousands of actual physical books, searched out and bought, for us to look forward to; patience is thin for poor writing or poor choices of focus. There is no patience for authors who abound in a style or vocabulary tendencies, that I loathe. No one should sit, grinding their teeth, through something that is unpleasant to them. That drives a decision I am sharing; not hasty boredom. Many might dismiss the wrestl Not finishing books, no matter how terrible or clashing, is not my way. However with thousands of actual physical books, searched out and bought, for us to look forward to; patience is thin for poor writing or poor choices of focus. There is no patience for authors who abound in a style or vocabulary tendencies, that I loathe. No one should sit, grinding their teeth, through something that is unpleasant to them. That drives a decision I am sharing; not hasty boredom. Many might dismiss the wrestling I put into this decision and say "Aw, just stop reading it". Books needn't grab us right away. I have loved many after 100 pages and was glad I persevered. No, I'm talking about seeing it is not going to be for you, content-wise, style-wise, or quality-wise. That isn't about being hasty. What a breach of taste, that this is an award-winner! A mystery should generate the tone of mysteriousness. I have occasionally converted into an audit, a book that bugged me early in. Therefore I am creating an option, as it arises, to declare a "DNS": "DECIDED NOT TO START"! I don't want to read 17 pages portraying a Mom driving her kids to school and their gripes. After the second chapter, the height of drama was no better than not having a salad for a picky neighbour! Not only is none of this of interest and annoying to me but chapters that don't end in a puzzle or anticipation, suggest that an author doesn't understand the creation of excitement.... or the construct of the mystery genre. I say this with a large collection of Jill Churchhill novels, that I sought out with enthusiasm. Thankfully, I am creating an ongoing book sale for my neighbourhood. Look, I have encountered others, like Marion Chesney Beaton, who thought adding a crime made it a mystery. (She has the distinction of my first "Decided not to start", after I did complete the first "Hamish Macbeth" novel, cringing and screaming). Focus, pace, tone, and style make the genre. What you dump into it is second place. I don't care how anyone categorizes something: if it doesn't feel like a mystery, or whichever genre it proposed to be, it did not succeed at being that. The first book in the Jane Jeffry Mystery series introduces suburban mom and sleuth Jane Jeffry. They are light humorous mysteries; not a lot of violencee or gore. The puzzles are interesting and Jane has a good knowledge of human nature, which helps her in her crime solving. There are good touches of humor; Jane's relationships with family and neighbors are well handled. A good series to start reading when you want a quick, light easy mystery! I love the sarcastic comedy. I love the characters. It's a fun read. I was given a copy of this and enjoyed it as a quick cozy mystery. It definitely reads like a cozy written in the late 80's early 90's. I know it's going to sound strange but when I finished my first thoughts were that this story felt very middle class right down to the reason for the murder. I'm not saying that the characters are shallow, but they definitely aren't complicated. At least not yet. There's a bit of humor with the main character Jane and she was actually likable and because she is I was given a copy of this and enjoyed it as a quick cozy mystery. It definitely reads like a cozy written in the late 80's early 90's. I know it's going to sound strange but when I finished my first thoughts were that this story felt very middle class right down to the reason for the murder. I'm not saying that the characters are shallow, but they definitely aren't complicated. At least not yet. There's a bit of humor with the main character Jane and she was actually likable and because she is far from having it all together she was relatable too. Because this is an older series and available as mass markets I can easily find them as inexpensive second hand/thrift store books so I will continue with these quick reads. Hopefully Jane's character will continue to develop and expand through her amateur sleuthing. This is the first book in the Jane Jeffry series. I have read some of the later books but never the first one. A fun, light hearted mystery that has Jane, a midwestern housewife, with the help of her neighbor, as the solver of crimes. This book points out that you never know what secrets lay behind the closed doors of your neighbors and sometimes it's better for your health if you don't know!! An easy-to-read book that flows effortlessly without having to think too much. Sometimes, that's just the kind of book you need to read. This is the first book in the Jane Jeffry series by Jill Churchill. I've already read one other book in the series and figured I'd start the series from the beginning. Overall, I think this is a fun, cozy read and certainly would appeal mainly to female mystery fans. I really enjoyed the Grace & Favor series by the same author, so I'm sure I will continue reading this series as well. "The most important thing she'd learned over the years was that there was no way to be a perf This is the first book in the Jane Jeffry series by Jill Churchill. I've already read one other book in the series and figured I'd start the series from the beginning. I love Jill Churchill's Jane Jeffry mysteries and their absolutely awful pun titles. This one is the first - where Jane sets out to figure out who killed her cleaning lady. I found the series at a time when a car-pooling, PTA mom who could solve crime on the side was my idea of the perfect heroine. I liked this book a lot, a fun story. I love reading a series of books that have the same characters. Can't wait to read the next 15 books. This is the first book in the series and one of Churchill's best. Hope you enjoy it. I saw this book and the title attracted me. I thought it would be humorous and it was. Jane Jeffrey is a single mom (not by choice) trying to raise 3 kids on her own. She lost her husband when he was killed in an accident. But she hides a little secret. All of the women that live on the street where she lives, are friends. They all car pool, take care of each other's kids of those that have kids. It seems like a close knit bunch. And most use the same cleaning lady--some think she's a wonderful cl I saw this book and the title attracted me. I thought it would be humorous and it was. All of the women that live on the street where she lives, are friends. They all car pool, take care of each other's kids of those that have kids. It seems like a close knit bunch. And most use the same cleaning lady--some think she's a wonderful cleaner and others think she's as lazy as they come. Until one day the cleaning lady turns up dead. Jane and her friend, Shelley, try to figure out the who-dun-it with disastrous results. It can be comical how things happen. But when they go out on a limb to catch the person, Jane's Uncle Jim (he's really not) and the police end up helping them even though the police are dubious that the plan will work. Will Jane figure it all out? Or will she end up like the cleaning lady for sticking her nose in where it doesn't belong. #1 in the housewife Jane Jeffry mystery series set a Chicago suburb. Three stars is a bit low but four would have been too high. I found the book okay but nothing special. If grades were used instead of stars I'd award the author a B-. The protagonist is a mother with three kids trying to keep her family together now that her husband is deceased. When a murder occurs next door, she's determined to find the culprit - why isn't clear. Suburban mom Jane Jeffry finds herself in the middle of a murder mystery right in her neighborhood – the cleaning lady! Trying to figure out why she was killed – possible blackmailer?? – leads Jane to snoop around in detective Mel Van Dynes’ case. Appealing characters and nice homey setting. What a great story; I wish I hadn't waited so long to start this series. I enjoyed this book. I need to read something light when I’m feeling stressed. This book was what I needed. The story was average, but what I do like is the main character. She made the book for me. 3.5 Nice cozy. Didn't love it, but there was nothing wrong with it. I will continue to series, but it won't be one of my top series to continue. Fast paced cozy mystery with good characters. Jane Jeffrey is struggling to rebuild her life and make her children's life as normal as possible after the death of her husband in a car accident seven months earlier. She feels that life is starting to get back to normal, but that normalcy is shattered when a cleaning woman is murdered at the house next door which belongs to her friend Shelley Nowack. Shelly and Jane are understandably upset about the murder and worry about the safety of their children, so even though the police are looking in Jane Jeffrey is struggling to rebuild her life and make her children's life as normal as possible after the death of her husband in a car accident seven months earlier. She feels that life is starting to get back to normal, but that normalcy is shattered when a cleaning woman is murdered at the house next door which belongs to her friend Shelley Nowack. Shelly and Jane are understandably upset about the murder and worry about the safety of their children, so even though the police are looking into the murder they begin a little investigating on their own. They have plenty of suspects - there was going to be a gathering at Shelley's house and people were in and out of the house dropping off food all day long. In fact, Jane even wonders if Shelley could be the killer. As Jane investigates, she realizes that several people had secrets they wanted to stay secret, secrets they could be blackmailed for and might even kill to keep secret. When Jane gets a little too close to the truth and a threatening note is left on her bed, she knows she has to solve the case quickly before she or someone in her family is hurt. "Grime and Punishment" is the delightful first book in Jill Churchill's Jane Jeffrey cozy mystery series. Jane is a well-written character - a single mother struggling not only to raise three young children, but also trying to accept the circumstances behind her husband's death. Her children - Mike, Katie, and Todd - are also well written and some of the best parts of the book are the scenes with Jane and her children going about their every day life. I especially liked the fact that Jane volunteered to drive blind children, it added a nice dimension to her character. Jane's method of investigating the murder was a bit unorthodox, my jaw dropped when she came right out and asked a suspect why she was being blackmailed, but she quickly won my sympathy when her abruptness backfired on her and she learned something that hurt her. Shelley is also well written - attractive, a bit too perfect and bossy, living in a house that is immaculate before the cleaning lady even gets there, and a penchant for driving too fast. Of the supporting characters, my favorite is Jane's "Uncle" Jim, a policeman who is a surrogate father to Jane and will do anything he can to protect her. The mystery is well plotted and the number of people that had access to Shelley's house means that the readers will have fun trying to pick the killer from the long list of suspects and at the end of the book, readers will want to go back through it to see all the clues Churchill cleverly planted throughout. The method Churchill uses to reveal the killer is a bit unbelievable but still a lot of fun. 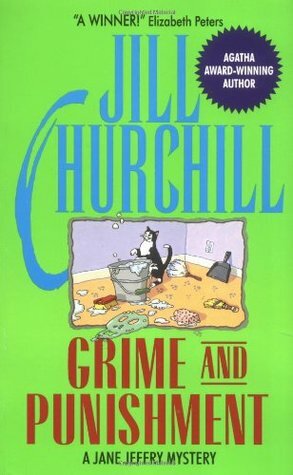 GRIME AND PUNISHMENT by Jill Churchill is 246 pages in length in paperback form. It is #1 in a Jane Jeffry Mystery. With three kids to raise on her own, Jane Jeffry sometimes needs a hand with the housework. But many of her complaining neighbors believe that the Happy Helper cleaning lady they all share wouldnt know a dustball if she was choking on it. That hardly seems reason enough, however, to do the disreputable domestic in. So wh GRIME AND PUNISHMENT by Jill Churchill is 246 pages in length in paperback form. It is #1 in a Jane Jeffry Mystery. I found this to be a delightful read. It is one you could read in an afternoon. More on the cozy side with some very smart remarks made between the PTA women but still I enjoyed every minute of this one. I have not read many books by Ms. Churchill, but I plan to in the future. This book moves along very well and even has a little element of romance between the widow Jane and the detective Mel and I would like to see how that develops. Shelley was by far someone that I know you all have had as a friend at one time or another in your life. What ever Shelley wants she is able to get. Reminds me of some Southern women even though this is not set in the South. I want to be just like Shelley and I think every woman wants to be like her as well. She is the organized one of the bunch and I adored her. I am giving this 5 out of 5 stars and can't wait to read the next book in this series. I really want to see what trouble Jane and Shelley can get into next. I also want to see how the relationship between Mel and Jane develops, as I am sure this was not the last we will see of him. Housewives solving mysteries. Eh. Okay. #1 in the Jane Jeffrey series. Jane Jeffrey is the widowed mother of teens in suburbia. This debut won the 1989 Agatha Award for Best First Novel and was Finalist 1990 Anthony Award for Best First Novel and Finalist 1990 Macavity Award for Best First Novel. Jane Jeffrey sometimes needs a hand with the housework. Many of her neighbors believe that the cleaning lady they all share wouldn't know a dustball if she was choking on it. When the charwoman in question is discovered strangled to death with #1 in the Jane Jeffrey series. Jane Jeffrey is the widowed mother of teens in suburbia. This debut won the 1989 Agatha Award for Best First Novel and was Finalist 1990 Anthony Award for Best First Novel and Finalist 1990 Macavity Award for Best First Novel. Jane Jeffrey sometimes needs a hand with the housework. Many of her neighbors believe that the cleaning lady they all share wouldn't know a dustball if she was choking on it. When the charwoman in question is discovered strangled to death with a vacuum cleaner cord, Jane decides to dig up the real dirt, even if it means provoking a killer who may live close. A pseudonym used by Janice Young Brooks. Jill Churchill, winner of the Agatha and Macavity Mystery Readers Awards, and nominated for an Anthony for her best-selling Jane Jeffry series, lives as Jane does, in a midwestern suburb. On purpose! She says writing this series and the Grace and Favor series is the best treat she can have without a knife and fork. Under her real name, Janice Young Brooks, an A pseudonym used by Janice Young Brooks. Under her real name, Janice Young Brooks, and various pseudonyms, she's written historical novels, a gothic novel, and a history textbook as well as many articles for newspapers and magazines. When she's not writing, she's avidly doing genealogy which she says is a lot like mysteries with all the red herrings, clues, speculations, and surprises.